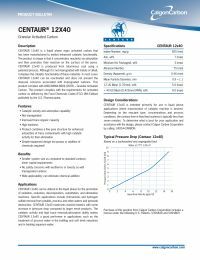 The Upflow Non-Backwashing Catalytic Carbon Filters are a simple, low cost method for treating city water to reduce chloramine taste and odor, hydrogen sulfide, and chlorine taste and odor. 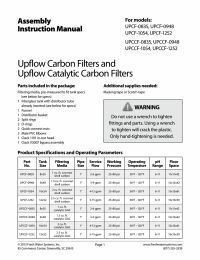 These upflow filters require no electricity and require no drain connections to operate. The water simply enters the tank down the center of the tank and comes up through the activated catalytic carbon media, lifting the media to prevent any channeling. Centaur 12 x 40 is a liquid phase virgin activated coconut shell carbon that has been manufactured to develop catalytic functionality. The product is unique in that it concentrates reactants via adsorption and then promotes their reaction on the surface of the pores. Go to Clack Parts and Accessories to purchase other Clack valve attachments for PVC, lead free brass sweat, 1" male NPT, or brass Sharkbite Quick Connect fittings.